I read countless blogs, watched videos, and searched high and low for the best advice in preparation for the PCT. Here are some of the most helpful materials I came across before and after the trail to help motivate me and educate me on trail life. This list will grow as I come across more great resources. Feel free to email me good finds! Boston & Cubby's 2010 Pacific Crest Trail Journal – "RESUPPLY BOXES:"
I found this post to be a great way to start brainstorming items to drop into my resupply boxes. Since I hadn't done much backpacking, let alone long-distance backpacking, I was pretty clueless on what foods I might want to eat on trail. The Trek – "Pacific Crest Trail Resupply Guide"
The Trek is a great resource from many different thruhikers, rather than one person's blog. This is by far the most thorough, detailed write-up of the various resupply options. Wander About – "Pacific Crest Trail Food Resupply Plan"
After doing my hike, I did end up regretting not doing more mailing ahead while on trail. Most of the mail drops I picked up while on trail were packages I had made months back, not knowing what I would like and dislike while hiking nor the quantities that I would consume. This made me wish I had spent more time making and shipping boxes up the trail. This post does a great job of laying out a strategy like that. The Trek – "PCT Clothing System: 3 Thru-Hikers Share Apparel Lists, Tweaks, and Best Practices"
This article is great because it shows how different people approach finding clothing for the trail – from the experimenters to the devout. Carrot Quinn – "Preparing for the PCT: One outfit for five months (or, where do I find a sunhat that doesn’t look stupid?)" Because it's important to find a sunhat that doesn't look stupid. Andrew Skurka – "Drop 4 oz from the ULA Catalyst in 5 minutes"
When I was in panic mode a week before I left for the PCT, I searched high and low for ways to cut weight. This post gives you some ideas on how to cut weight (literally) from ULA packs. Greenbelly – "42 Ultralight Backpacking Tips: How to Shave Pack Weight"
This post has a bunch of unique ways to cut weight. Some are kind of nuts (see: Rocks vs stakes), but others are great little tips (see: Use Lithium batteries). Backpacking.net – "Backpack Weight Reducing Tips!" Another post I came across during my pre-hike panic. Even if you're not trying to be an extreme ultralight backpacker (not me by the way), this post at least has some neat ideas. Chita 21 – "ultralight backpacking tips and tricks." IntenseAngler – "DIY Sleeping Pad Inflator"
Ying Tin – "Sawyer Squeeze Water Filter backflush with smartwater cap"
Watch this video to learn a quick and easy way to backflush your Sawyer Squeeze water filter with a Smartwater water bottle. Theo on the PCT – "Lessons Learnt"
Theo (AKA Blis) was a member of my trail family on the PCT, and he wrote a wonderfully extensive and helpful list of his takeaways from the trail. Well worth a read. reddit user, meta474 – "Why the PCT will change your life and why you shouldn't care about umbrellas, camp shoes, resupply food, snow levels or water caches." When I was absolutely freaking out about the hike days before I left, I really valued reading this "drunk guy's thoughts." This is a wonderfully comprehensive and thoughtful piece sent in from a reader on how to help your kids (from toddlers to teens!) learn to love and grow in the outdoors. I am so thankful that my family went on hikes and camping trips, and this post is full of great tips on how to do just that and more. This website is chock-full of very detailed information about the PCT and other adventures. One of the best resources on this site is the Annual Pacific Crest Trail Thru-Hiker Survey which compiles responses from hikers on gear, resupply, and basic demographics. "Annual Pacific Crest Trail Thru-Hiker Survey"
"The Ultimate Pacific Crest Trail Packing List"
"The 11 Worst Moments On The Pacific Crest Trail"
Dixie, AKA "Homemade Wanderlust", hiked the AT in 2016 and the PCT in 2017 and somehow managed to keep up amazing vlogs on trail. She also has great informational videos about her experience on her YouTube channel. "Why I Don't Stress About Base Weight"
"My Luxury Items on the Trail"
The water report is a crowdsourced resource that is updated routinely during regular hiking season. 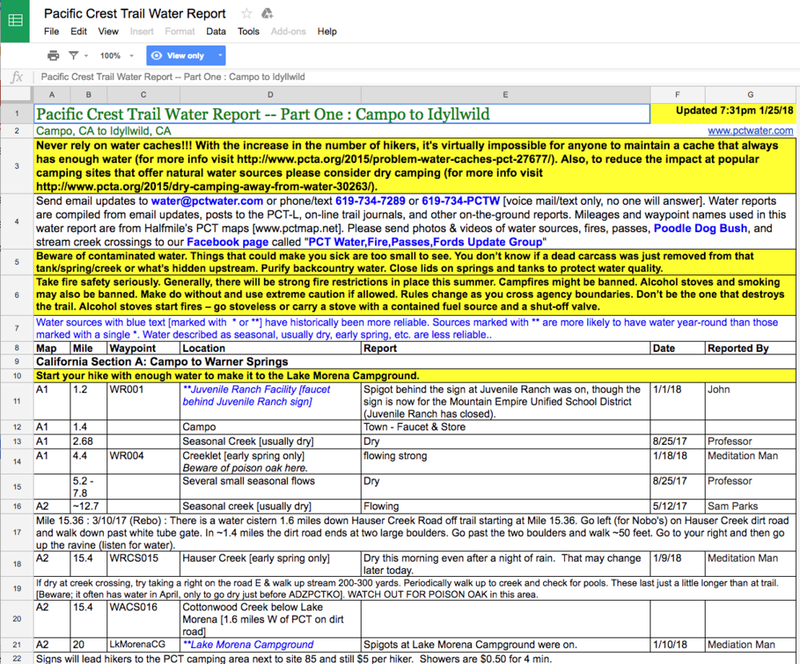 It lists out the water sources on trail and people on trail send in information to the administrator of the water report so others can get updated information to prepare. I recommend downloading the Google Drive app on your phone and remembering to update this sheet each time you have service. These resources can be hit-or-miss depending on the quality of the people interacting in the groups, but I've found that forums on these websites can be great places to ask specific questions. I've loved the Women of the PCT Facebook group as the women on there are nothing but helpful and supportive to each other. Additionally, the PCT Water,Fire,Passes,Fords Update Group group compiles up-to-date information on the trail conditions.